GLS provides an easy way to send parcels across Europe, with a distribution network that includes 41 countries and services for both individual customers and commercial organisations. Parcel tracking is one of the core services provided by GLS. To track an order, simply enter your parcel number (or tracking ID) into their online form and press “search.” The system will then bring up the specific order you need to track and you will be able to see exactly where your parcel has got to. Tracking is free for all shipments and it’s easy to track multiple parcels if necessary. The process also doesn’t end when the parcel reaches its destination. If you or the recipient are not present to take delivery of the parcel, the courier will scan the notification card, and after that you can quickly find out how to pick up your parcel by logging onto the tracking console. The GLS App makes parcel tracking even more convenient. Available from the Apple App Store and Google Play, the GLS Mobile App provides tracking services wherever you are and also makes it easier to locate pick-up points on the ParcelShop network. Another feature enable you to scan the barcodes on notification cards when you miss an order, so you can find out exactly where your parcel is. 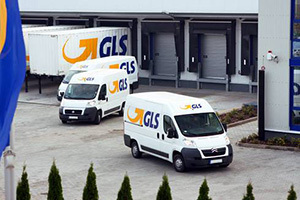 GLS (General Logistics Systems) was founded in 1999 when 25 German delivery companies amalgamated under Dutch leadership. Within four years, the company had added Irish, Austrian, Hungarian, Danish, French, Spanish and Belgian operations and had partnered in the UK with Parcelforce Worldwide. Nowadays, GLS has a revenue of EUR2.2 billion (£1.8 billion), more than 20,000 vehicles and 200,000 regular customers across Europe who send 431 million parcels every year. GLS provides parcel deliveries to any European locations between 24 and 96 hours after dispatch. Express deliveries are also available, and will arrive within 24 hours (for national deliveries only). All parcels can be delivered to your home, workplace or a shop in the GLS ParcelShop network in Central and Eastern Europe. Along with their conventional shipment services, the company also offer integrated IT support for dispatch systems, helping companies manage their logistical demands. Could be a mistake made by sender or the delivery guy. Please call the shipping company or ask sender to investigate this case. I would like to know when my parcel 37637504736 will be delivered as it was supposed to be today. Hi, I’m tracking a parcel from Ireland and all the information is in a foreign language. When would it arrive to Crawley?